Age as on 31st March 2019. Essential Qualification : Students Studying in Vth and VIIIth Standard(For SC/ST/PWD Candidates Min 50% Marks Required). 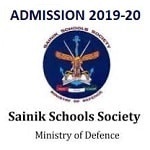 Eligible Candidates can Submit Application by using Online Link at the Official Website of Sainik School Society latest by 1st December 2018. Applicants First Logon to Sainik School Admission Official Website. Register by Clicking on New Registration(Application Form) Link.